Violence is not funny - but a lot of violence is very funny. At least, that's the idea behind Evan Dorkin's Milk & Cheese. Starting as a series of in-jokes and convention sketches, Milk and Cheese eventually starred in a few strips in various magazines, which were then collected in a comic from Slave Labor Graphics: Milk & Cheese #1. This was followed by Milk & Cheese's Other Number One #1, Milk & Cheese's Third Number One #1, Milk & Cheese's Fourth Number One #1, Milk & Cheese's First Second Issue #1, Milk & Cheese SixSixSix #1 (and so on in that zany fashion). And in 2007, they became toys. Milk & Cheese are sold in a two-pack, which makes sense since there's nothing sillier than a pair of characters sold separately. They were created by Monkey Fun Toys, which is apparently a division of Slave Labor Graphics. So Monkey Fun Toys:SLG::Big Blast:Graphitti Designs. The figures were sculpted by Mitch Martinez, whose website was a MySpace page back when the box was designed, which gives you an idea of how long ago this was made. In the comics, Milk and Cheese are both very expressive: their faces move like cartoon characters, and there's a little bit of squash and stretch in their movements. However, since they've only ever really been drawn by one guy, and he designed the figures, they're looking right. 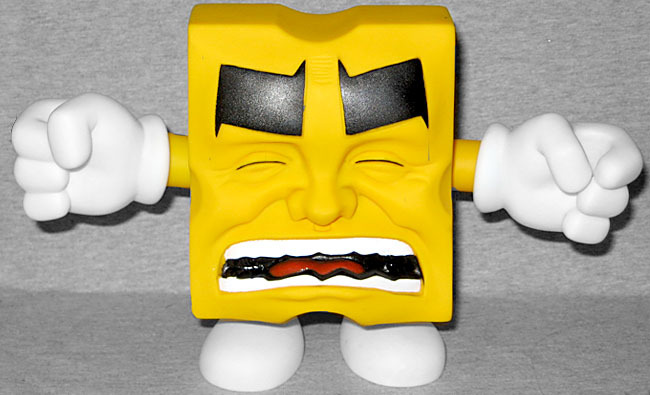 Both figures have their eyes squinched shut and their mouths open in a cross between a grimmace and a shout. Their faces are three dimensional, not just etched into the surface of the figure - hey, with this kind of thing, you never know. They're both rocking the trademark "Evan Dorkin eyebrows," which are super thick and sort of Z-shaped. 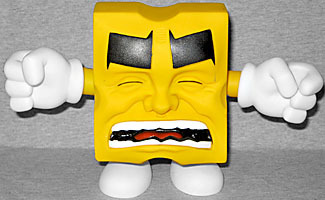 There are small sculpted lines on the forehead, another feature recognizable from the source artwork. 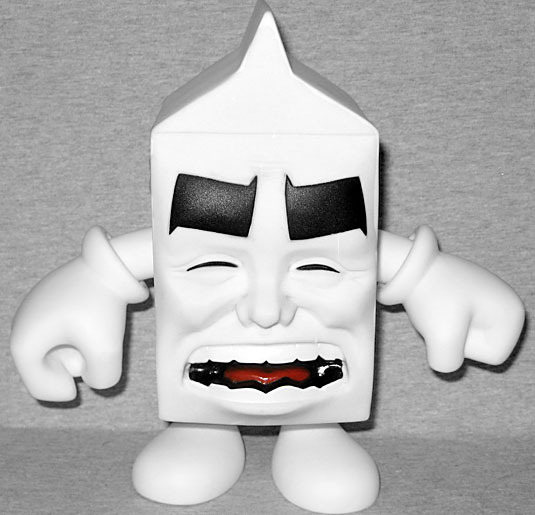 Milk is 7" tall, and looks just like a standard milk carton. Except for the face. And the indentations where the arms poke out the sides. So basically, the back. The back looks like a standard milk carton. But it doesn't have a hollow where the waxed cardboard was folded over. Maybe we should stop saying it looks like a standard milk carton. Also there are feet sticking out the bottom. Cheese, like all cheese in cartoons and comics, is a wedge of yellow Swiss. He may not have holes running all the way through him, but there is a hole-ish divot taken out of him on every edge. He's vaguely triangular from the side (technically a trapezoid, but definitely not the cube I was expecting) and stands 5⅜". His upper eyelids overhang the lower ones, so the amount of black paint you'll see there depends on what angle you're viewing him from. His arms are stumpier than Milk's, but they both have two little ridges on the bottoms of their feet - shoe treads, maybe? The figures are done "urban vinyl" style, which means they're hollow roto pieces. It also means they cost a ridiculous amount of money - the SRP was $70 for a two-figure set? That's ridiculous. It's nearly freaking criminal! 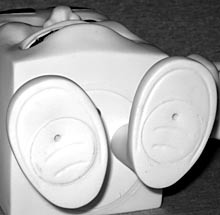 Rotocasting costs less than injection molding, so even with a limited production run the cost should be lower than an equivalent release. You can get them cheaper now, since people realized that seventy fricking dollars is beyond stupid. The figures have six points of articulation - wrists, shoulders and hips - and they're all swivel joints. 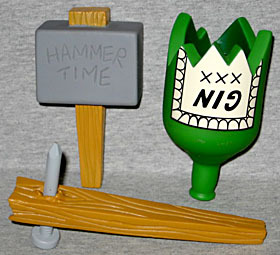 The set includes three weapons that these little monsters can wield: a broken bottle of gin; a mallet with "Hammer Time" inscribed on one face; and a board with a nail in it. The board and nail are separate pieces, so technically you could give one of them the nail by itself, but why would you want to? 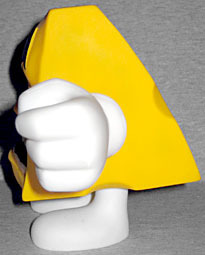 Each figure has a hand molded to accept the accessories, while the other is molded as a fist. 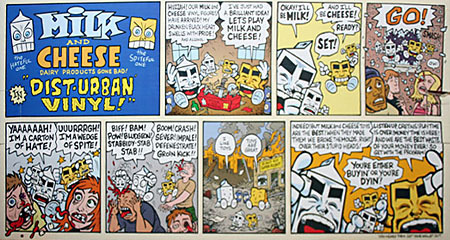 The Milk & Cheese comic is kind of a one-note joke - "massive violence lol" - but then again, can't the same be said for pretty much anything that's ever been on [adult swim]? 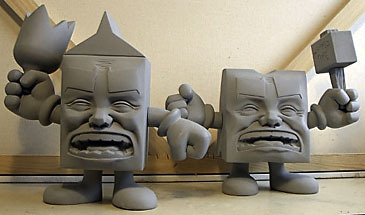 I sculpted a set of Milk & Cheese figures for an art class in high school, but these, naturally, are a ton better than those were. They're not in scale with anything, but they've got a cool design and they're well-made. There's no way on earth you should pay $70 for them, but at a more tolerable price? Bring home the carton of hate and the wedge of spite.